This WiP Wednesday thing is working out really well, eh? 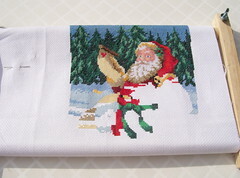 While I haven’t been posting, I have been busily stitching away on Checking His List. I’m nearly done with the top half of the chart, if you don’t count the backstitch detailing. Or the lines where Little Miss’ real name goes, which I’m saving for last. Sunday night, I got together with some lovely ladies from church to do some knitting. I cast on for a Snicket sock, modeled here by the metal piece that sits on the top of our Lava Lamp. 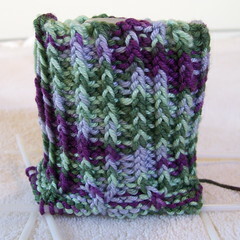 I’m using Catania cotton yarn, which might not have been the best idea ever. For the little cables that make up the lattice pattern, something with a bit more spring to it would probably work better. Especially since I cable without a cable needle. I quite like the way the colors swirl in the ribbing, but they seem to be breaking up differently as I start the lattice part. 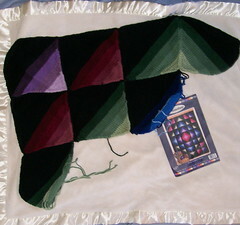 I also pulled out Amish Shadows and took a look at it, but I haven’t done any work on it in a while. I don’t know what to take to see the Yarn Harlot on Saturday. I have a copy of Socks Soar on Two Circular Needles slowly but surely working its way over to my library, so maybe I’ll be able to cast on a simple sock before Saturday. Although I’d need to pick up a couple of small size cable needles first. Leave a comment on Too Cute! Hedgehogs! Penguins! Wool! What’s not to love? Spending all of my free time on Ravelry wasn’t enough, clearly, even with the 20 groups within the site I’ve joined. One of those groups is the one for Secret of the Stole, a mystery lace project. What can I say? All of those MS3 posts got to me. And I did just buy that Lisa Souza Lace. Tomorrow I go in search of beads, having discovered that my five packets of Mill Hill seed beads are size 11, which is too small. It’s not even like I needed a new project. I’ve already reached QBLE – Queue Beyond Life Expectancy – and I keep adding more. And, yes, several of those projects could have used that yarn. And LM’s stocking is ticking along. I took a few days of rest and cast on some Debbie Bliss Merino DK for Branching Out from Knitty, but I’m back to it. 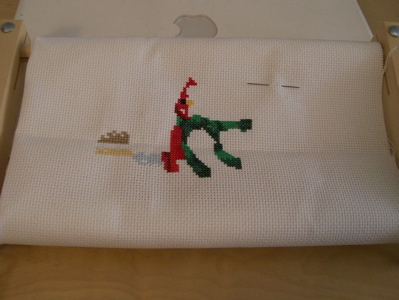 The background trees are done, along with a large chunk of the scroll, Santa’s face and beard, and most of his hat. I’m fascinated by the way cross-stitch is like an impressionist painting. I get so used to looking at it close up, examining each stitch, but it looks so pretty from a few feet away, when each little X or / blends together with its neighbors. I bought this as a kit at a church holiday bazaar in 2005. In the picture on the booklet, the orange yarn doesn’t have nearly so much red, and it looks a lot like Nemo from the Disney movie. My fish, not so much Nemo-ish, even with the “lucky fin”. There’s also a note not to use the “safety eyes” if the fish is for a child under 3, so I’m tucking this guy away for a while. Many thanks to Ellen, who reminded me about the Fabulous Fiber Fest going on this weekend. I did have it on my calendar already, but it was nice to get a reminder. I loaded Little Miss into the car, and the two of us hit the Fest on its last day this morning. I was a little surprised that there didn’t seem to be any local yarn vendors there. Maybe I was spoiled by Stitches West a few years back, but I remember a bunch of Bay Area shops had space in the Expo. The Fiber Fest was a little smaller than I would have imagined, but that didn’t stop me from spending some money. 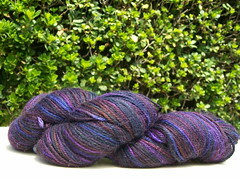 I started out at Carolina Homespun, where I picked up some sock yarn. I also came thisclose to buying some fantastic pink Pygora from Peppermint Pastures, and then I remembered that I don’t spin. I wandered around until I came across Sheila & Michael Ernst of Glass Pens, from whom I picked up a little more sock yarn. 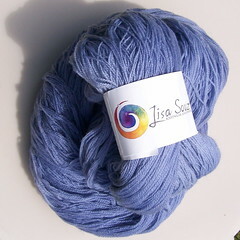 I strolled past Lisa Souza‘s booth a couple times before stopping and buying some laceweight. At that point, Little Miss was getting hungry, and I had spent all my money, so it was time to go. Next year, I’m taking a spinning class. Maybe. We’ll see. 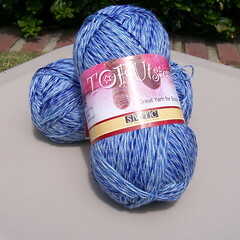 Leave a comment on Yarn Harlot Ahoy! 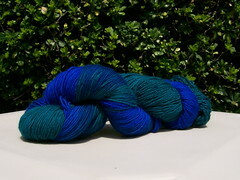 I’ve just RSVPed for the Yarn Harlot’s appearance in Los Angeles. This means that I will be spending my first Saturday off from the library in a month… at the library. Funny how that works out. For months, I’ve been saying that I wanted to cross-stitch new Christmas stockings for the family. K has a stocking her mom made for her when she was little, but my stocking is plain red fake fur (although my dad did recently send me my childhood stocking), and Little Miss doesn’t have one yet. So, when JoAnn Fabrics sent me an email about their “Christmas in July” sale, I went for it. I ordered three stocking kits, all featuring Santa. I’ve started on the one for Little Miss. It’s a Dimensions pattern, called “Checking His List”. So far, I’ve finished Santa’s belt and a bit of the jacket. I have a long way to go. This is a lovely little sweater, but I’m concerned that Little Miss is going to outgrow it before it gets cold here. Especially since my unfortunate row gauge seems to have resulted in a sweater a good three inches shorter than it was supposed to be. Love the yarn, though. Which is good, since I have two bags of it earmarked for a Hooded Jacket for Little Miss and a Cardigan for Arwen for me. Inspired by something I read on (where else?) Ravelry, I’ve decided to start doing WiP Wednesdays. So, of course, I’ve been having technical difficulties with this here blog all evening. But I’m here now, with three hours to spare. Allow me to present the Baby Shrug, from Debbie Bliss’ Simply Baby. The yarn is Cashmerino Aran in lilac, purchased from SuperCrafty a few months back. It’s very cute and oh-so-soft, but even though I made the 12-18 month size for Little Miss, who is now only 5 months old, I think she may outgrow it before it gets cold enough to wear it. The pattern is fairly clear, although I didn’t see any need to switch from straights to circulars – I just used my Denises the entire time. And I ran into an issue in the sleeve shaping after the right front. If one starts with a right side row (as one does) and then works an odd number of rows, then when one reaches the instructions for the front shaping, one is on a wrong side row when the directions say one should be on a right side row. I think I solved this by knitting an extra row (or maybe one row short – I don’t remember), but I’m wondering if I missed something. Missing something would explain why the chest and sleeve measurements are right on, but I seem to have come up a couple of inches short in the length to the shoulder. Well, missing something and the fact that my row gauge is off.